Our newly renovated barn can accommodate parties of up to 200 people. The upper level of the barn features a soaring beam structure with ample natural lighting. Four large HVAC units are cleverly hidden inside rough wood grain bins to preserve the rustic interior of the barn. The upper level can be configured to accommodate myriad arrangements for guest seating, dancing, service lines, and live music. In recognition of R.D. Shepherd’s history in New Orleans and the architectural sensibilities, he brought to Wild Goose Farm, the lower level of the barn now features lively painted walls, fixtures, floral displays, and furniture embodying the colorful flavor of New Orleans. In the bridal changing suite, we feature finely carved wooden screen dividers, antique furniture and mannequins, and full-length mirrors, which bring a classic feel to the room. The brick floor of the bridal suite has been laid in a tight herringbone brick pattern, replicating the original floors of the lower level – an incredible extravagance for a barn in the 1840’s. The groom’s room is smaller but also refined, featuring fine wainscoting, a professional poker table, and comfortable chairs. Our catering kitchen provides 2 standard warming boxes, a commercial refrigerator and freezer, and stainless-steel sinks and prep table. The rooms in the lower level are connected by a cozy social area with stylish bistro furniture. Wireless internet access is available throughout the barn, although we give the bride and groom the choice of whether or not to distribute the password. We are pleased to offer a venue that is comfortable year-round, historically significant, and safe. 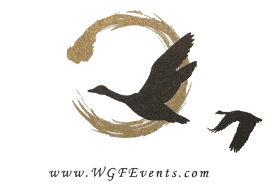 Wild Goose Farm has been zoned for special events, such as weddings, and the barn renovations have passed all relevant building, fire, and safety inspections. For a 3-D virtual tour, please check our posting on WeddingWire.com where we are listed as WGF Events LLC or click on this link: https://www.weddingwire.com/biz/wgf-events-llc-shepherdstown/40c4e135b25aafe6.html#3d_tours.